The PlayStation 4 has made a name for itself as the premiere console for free-to-play games. From its first day on the market, players could enjoy games like Blacklight Retribution and DC Universe Online. Since then, the lineup has broadened to include other big names like Warframe — and while it took over two years, World of Tanks has now joined the PlayStation 4’s ranks. This legendary PC game first hit consoles on the Xbox 360 and then on the Xbox One with a slew of improvements. New modes were added, the controls were tweaked a bit and and the graphics were completely overhauled. 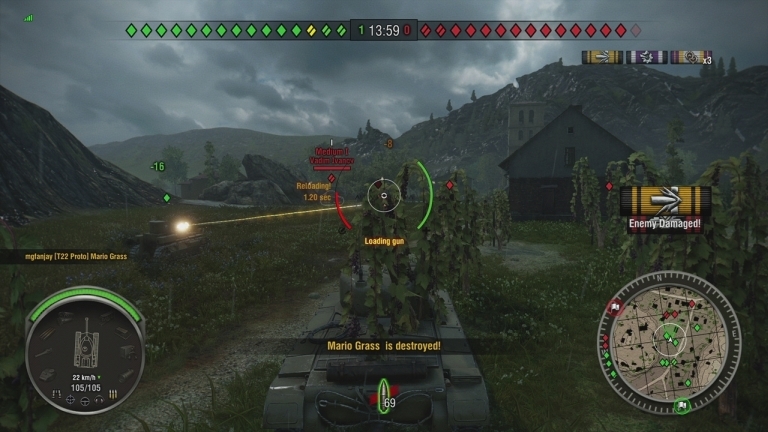 World of Tanks simply threw players into the fray on 360, forcing them to learn as they went. Proving grounds debuted on the Xbox One as a new feature for the current-generation incarnations and goes beyond a regular training mode. You’re given extensive instructions on what to do in the game, a full walkthrough of menus if you want it, and then given a chance to try everything out on the field. The core game is a team deathmatch with a slew of modes beyond that. Standard things like capture the flag are here as well as things you wouldn’t normally expect like racing. Just getting from point A to B faster than others is fine, but you also have to factor in things like enemies trying to destroy you. Your guns are always live, which means your treads can be shot out or you can do that to an enemy. Weakening them can make your positioning stronger and thus allow you to win via force instead of finesse. Anyone who hasn’t played the game before and is coming in expecting it to be an action-heavy experience that you can just run into carelessly will be slightly disappointed. You need to think first and act second in order to survive — let alone excel here. Positioning is key and you’ll need to be mindful of both where you are and where your enemies are in relation to you and your cover. If you’re behind a wall, you don’t want to just fire a shot blindly without having a good chance of landing it. Giving away your position to one enemy can swiftly lead to disaster. The best course of action is to make slow and steady progress towards your enemies. Pick out the least-populated area you can find, and strike whenever you get a chance. Your teammates will hear the combat, see you marked as a friendly troop, and hopefully come in to help topple that enemy quickly while you reload your cannon. The tank selection is incredible and goes far beyond a basic selection. You can pick tanks, go between the tank selection from certain nations, and progress for each of them. You can choose between light, heavy and medium tanks. Some focus on being artillery tanks, while the faster tanks allow you move more briskly — but you run a far greater risk of taking damage. Artillery tanks are built to take tons of damage — best for people who want to sit back and absorb damage — and demolish enemies quickly. Light tanks are a must for players who value maneuverability over all else. We found that while they do lead to faster deaths, the controls are generally a bit snappier with them. As a result, the game is more fun to play and finds a better balance between serving both the action and strategy masters. Online play is going to eat the bulk of your time as the proving ground mode is simply a way to either gain experience at the core game or maybe dink around for a bit if you’re short on time. As a result, it’s imperative that every core function work really well. That means you can’t have much lag and the experience should feel like it would offline, only with all of the perks of online play. Fortunately, that’s exactly what has happened here as online play has no major issues to speak of. The player base is generally nice and after several days of play, only a couple of less-than-idea players were encountered. 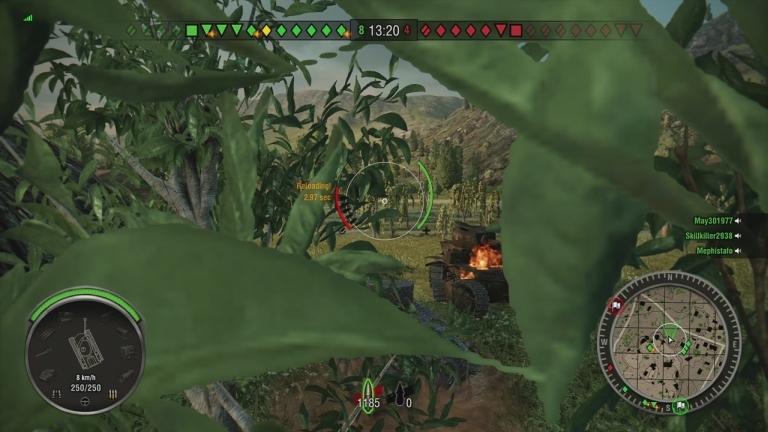 Visually, World of Tanks has received the same overhaul on PlayStation 4 as it did on Xbox One. When comparing the PS4 version to the 360 and PC versions, this incarnation is the clear winner. Grass has a real-life look to it and actually appears to be blades of grass that move upwards from the earth. Before, you were looking at textures resembling grass only on a surface level. Lighting effects have been stepped up quite a bit. Shadows are now realistically cast over everything and storms rage through as well. Thunder blasts the world while lightning flashes offer a stunning sight. Rain adds a lot to the experience as well as it beads off of the metal and even appears to build up a bit on the surface of the tanks. World of Tanks isn’t “just” a good-looking free-to-play game — it’s a genuinely impressive PS4 game. World of Tanks has some of the best sound design out there. The sound effect work is impressive from the start — with bullet sounds signaling every menu option. The tank rolling sounds are things you’ll want to pay attention as well since they can give away an enemy’s position. If nothing else, you’ll at least know what general direction they’re in and whether you should roam behind cover or stay where you are and just rotate your turret. Having the sound effects play such a crucial role in the strategy is admirable and definitely makes the game better. Explosions have a satisfying impact and it sounds like metal is going to be sent flying with every blast that connects. Sounds effects are overlooked far too often nowadays, so it’s encouraging to see how much effort went into them here. Musically, the war-style music fits perfectly. Every song is loud, full of heavy percussion and fits the whole war theme like a glove. The songs make you want to not only shoot up enemies, but also just keep playing. The refreshing thing is that the soundtrack isn’t just generic rock like you hear in so many games of this kind. 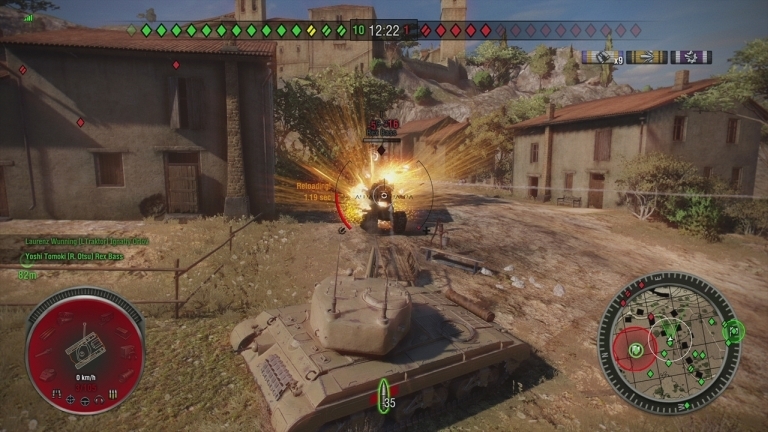 World of Tanks has arrived on PlayStation 4 in spectacular fashion. It plays better than it ever has before on a console, looks fantastic and features some PS4-only content to add extra value. What’s here is nearly identical to the Xbox One version, but it’s impressive that Wargaming has spent so much time refining it to make it feel as if it were originally built for PS4 when they could have easily plopped the Xbox version on the platform and swapped the button prompts. Timed-exclusive maps Skorpion Pass and the updated version of Ruinberg are a blast through and through, while the PS Plus exclusive German Pz.kpfw. II Ausf. J-PS is a force to be reckoned with. 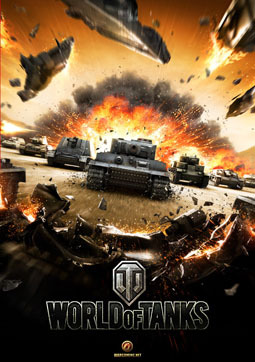 Those who have already built a respectable tank life for themselves on Xbox One don’t have much of a reason to hop over, but for anybody who still has somehow managed to avoid playing the game, PlayStation 4 is the place to play World of Tanks.